Klaarchitectuur fashions an office space for their firm that balances the building's communal past with modern workplace needs. 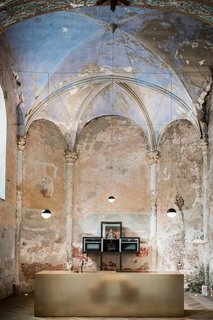 Klaarchitectuur, helmed by architect Gregory Nijs and located in Truiden, Belgium, writes of the project to transform an historic chapel, "One of the most important requirements at the start of the design process was to reopen the historic building to the public." To do so, they left the chapel's central cavity open, then stacked a series of boxes up one wall. The boxes contain crucial office functions such as storage space, bathrooms, work space, and a conference room, leaving the main area to be available for a range of public events. "This way," writes the firm, "a building...which has played a crucial part in the lives of so many, can once again come to life and serve an entire community." In order to preserve the building's status on the historical registry, its shell was left intact, complete with exposed brick and chipped plaster, faded frescoes, and domed ceiling, and the new construction was built to be free-standing. As such, "the new construction stands in sharp contrast with the old, [whose] walls still tell the story of the past," write the architects. 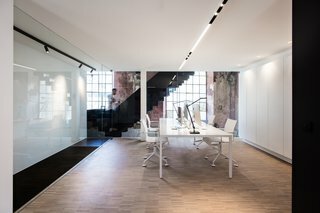 Crisp, contemporary finishes on the inserted office spaces, including a dramatic black staircase, striated wood floors, and white-painted walls, further underscores the tension between old and new.